State and municipal revenue agencies have special units designed to discover non-compliant taxpayers and to ensure that the appropriate tax obligations are captured and remitted. Harmari Taxcrawler has been proven to help revenue departments to find and recoup tax revenue. Harmari Tools help detect and monitor fraud and criminal activity on online classifieds, e-commerce sites and social media websites. Harmari Tools, developed by LTAS Technologies, analyzes online classifieds, e-commerce and social media sites to identify pages suspected of fraud or criminal activity. Harmari Tools can be used in investigating auto theft, auto fraud, and curbstoning, criminal investigations, insurance fraud, tax scofflaws, and unlicensed businesses. Short Term Rental Compliance with Taxcrawler, which helps with identifying and monitoring properties for lodging tax collection, licensing and code compliance. 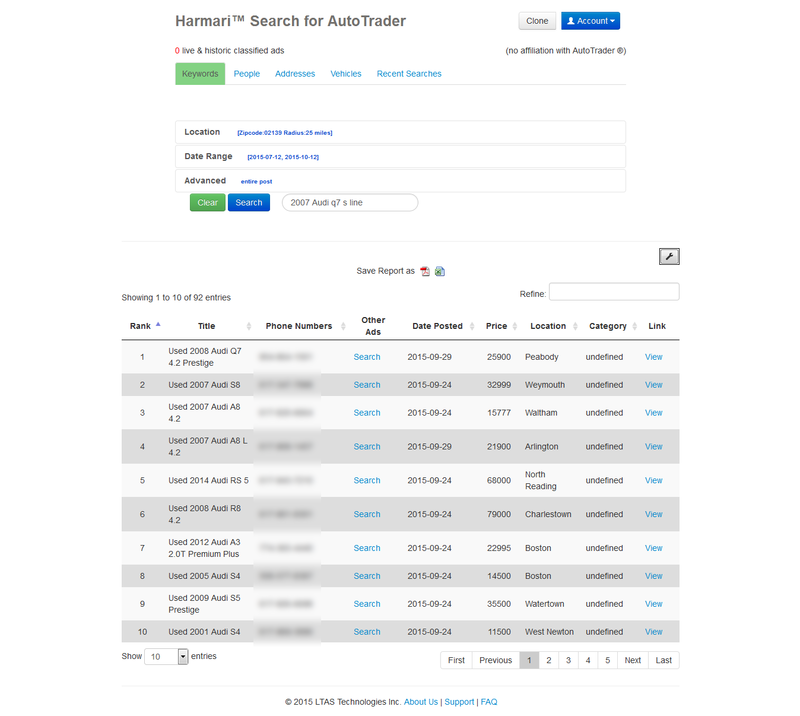 The Harmari Tools save you time when analyzing many classifieds at once, conducting preliminary investigations that are more efficient and more complete than a manual analysis. The Harmari Engine can analyze any one of the following websites and prepare a report suitable for your investigation, compliance and enforcement efforts: Craigslist, eBay, AutoTrader, Yelp, Urbanspoon, Foursquare, Amazon, Facebook, Etsy, AngiesList, VRBO, AirBnb, LinkedIn, Homestars.